Pacific Rim Bank in Restaurant Row, the first banking institution to open in the state in decades, will have its grand opening Friday. Pacific Rim Bank, the state's first new banking institution since 1959, held a soft opening yesterday at Restaurant Row for investors and friends, ahead of its official debut to the public Friday. The single-branch bank, headed by former City Bank executive Austin Imamura, raised the required $10 million to $12 million in funds needed to open and actually received more investment than expected, Imamura said yesterday. "We're very happy about (the bank opening) and our people are excited," said Imamura, the bank's chief executive officer. Imamura said Pacific Rim held the soft opening because there is still minor construction going on. He also said he wanted the 20 employees to do a dry run. "The tellers are practicing, and hopefully by the time Friday comes around they'll be up to speed," he said. Pacific Rim, located at the corner of Punchbowl and Pohukaina streets, will mark its official opening at 9 a.m. Friday with a Hawaiian blessing ceremony. It will be open 8 a.m. to 4 p.m. on weekdays and 8 a.m. to noon on Saturday. Pacific Rim is the eighth financial institution headquartered in Hawaii and the fourth state-chartered bank. The number of banks decreased in September 2004 when the parent of Central Pacific Bank finalized its acquisition of the parent of City Bank. Nick Griffin, commissioner of the state Division of Financial Institutions, said Pacific Rim's customer base will be individuals, small businesses and commercial real estate. Another startup institution, Ohana Pacific Bank, is still awaiting federal and state regulatory approvals. The bank, which will be at 1357 Kapiolani Blvd., had planned to open in March but now is looking at opening in middle of the year, according to Wayne Miyao, one of the bank's directors. Ohana Pacific Bank is looking to raise $12 million, CEO Woon Hyun has said. The bank needs to get its regulatory approvals before it officially can begin raising the money, Griffin said. Griffin said he's glad to see the state's financial services industry growing again. "We're pleased to see renewed expansion," Griffin said. "There has been a lot of consolidation and I think that Pacific Rim, and the application from the founders of Ohana that's in process, indicates the market feels there's room for new players, and we encourage that." 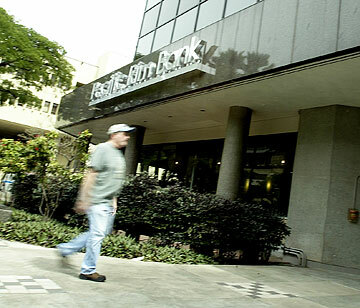 Pacific Rim joins First Hawaiian Bank, Bank of Hawaii and Central Pacific Bank as state-chartered banks. Finance Factors is a state-chartered financial services loan company. American Savings Bank and Territorial Savings Bank are federally chartered savings banks. Hawaii National Bank is a federally chartered national bank. Griffin said the advantage of being a state-chartered bank is that the primary regulatory authority is the Division of Financial Institutions in Honolulu. "We're familiar with local conditions, the economy and the industry locally, and we feel that gives the state charter a lot of value in that we're on the same page," Griffin said.